Eating local foods is better for your body, for the world, and for your taste. Each year, more and more people want to know where their food is coming from. They want a connection with their food and the farmers who grow it. When customers buy local, they build relationships with the farmers at the market, the cheesemonger at the cheese shop, or the beekeeper the local apiary. Supporting these food artists evoke social, emotional, and psychological benefits to customers. People want to form relationships with and support their local businesses. Additionally, customers are turning toward fresher, healthier and better-tasting food. And the answer to these demands is to buy local. 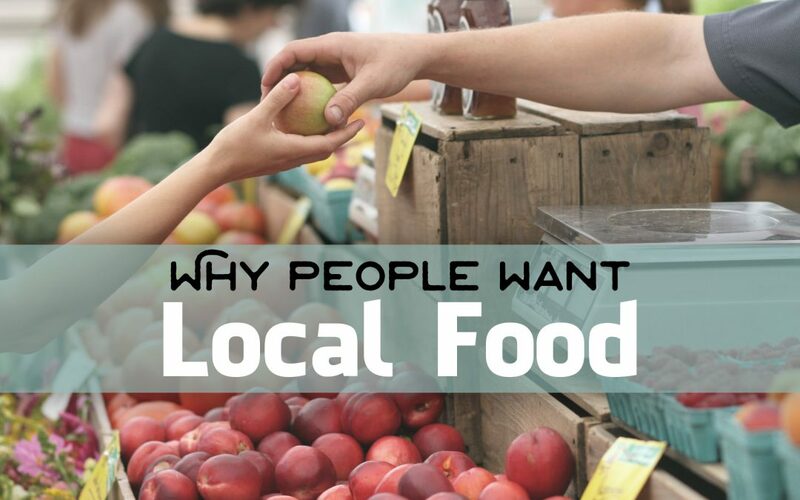 Here’s are some of the reasons why people want local food. The #1 difference between produce and/or other products purchased locally versus the grocery store is that the harvest time is much smaller from production time to your table. As a result, whatever nutritional value that particular item holds is less likely to decrease. Food has less chance of changing in quality and overall contamination the fewer the steps between its source and destination. The longer the food sits the more it decreases in nutritional value. Researchers at Montclair State University compared the vitamin C content of broccoli grown in season with broccoli imported out of season and found the latter had half the vitamin C. Consumers feel more connected with food when they know where it’s coming from. Local food tastes better and is fresher than food that has been transported hundreds of miles away. In the U.S., the average fruit or vegetable travels 1,500 miles from where it was grown to your dinner table. Farmers harvest food at the optimal time instead of speeding up the harvest to meet shipping and distribution expectations. Most produce at local farmers markets are picked within 24 hours of distribution. Any money that goes towards local farmers ends up being reinvesting within the community and other businesses. By buying locally grown food you’ll be strengthening your community by investing your food dollar close to home. Only $.18 of every dollar, when buying at a large supermarket, go to the grower. Around $.82 go to various unnecessary middlemen. Once you remove them, you are paying the farmer directly. Farmers work hard to put together community supported agriculture programs (CSAs) to encourage local residents to shop locally. They show up every week to offer their handpicked food to the community.. They meet with chefs and restaurant managers to sell their food so that it’ll show up as a menu item the following week. Farmers and local vendors work hard to take the quality items they’ve grown and nurtured to bring to us consumers. It is truely a labor of love!